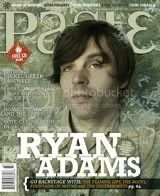 PASTE MAGAZINE is a monthly music mag that covers adult-album-alternative (Triple A), Americana and indie rock, each issue includes a full-length sampler CD (20 tracks). And it’s yours, all 11 issues for a buck. Technically, the offer is name your own price but you can go as low as one dollar. However, if you can afford to be generous, why not be. After all, this is quality stuff here, voted #21 on the Chicago Tribune’s ’50 Best Magazines’ list (right behind The New Yorker) and “Magazine of the Year” at the 2007 & 2006 PLUG Independent.